A bloated face makes you face look fat. Luckily enough, there is something you can do about it! Try out this lymph drainage massage to slim face for one! What can I do to slim face when my face is bloated? When you have a bloated face sometimes all it takes to get you image back is a 5 Minute Lymph Drainage Massage that help you get that Slim Your Face you are used to looking at. Otherwise, known as a manual lymph drainage self-massage (or simply a lymph massage), these face massages help drain lymph nodes restoring balance to your contour reducing water retention in your face. Although there are many lymph drainage massage techniques, the area that lymph massage drainage comes to the rescue when you need it is in ways to slim face. 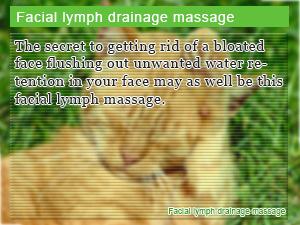 Massage lymph drainage is perfect for times of emergency such as when you have a bloated face in the morning. In this face Slism, we present a lymph drainage massage that you can use to slim face, just what you need to get rid of a bloated face in the morning, eliminating unwanted water retention bloating your face. What can I do for a bloated face? It is said that good fortune comes to those that smile. That is to say that people who smile more live their lives out happy. 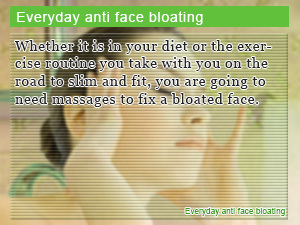 That makes sense but what if your face looks bloated all the time. Just because you don't notice at first that your face is bloated, doesn't fix the fact that you have a bloated face ruining your contour that brings out your smile. Not everyone is able to admit to a bloated face and stomach thinking it's only momentary. My face is bloated…Nothing good ever comes from failing to accept the reality of situations. Now that we got that out of the way, let's talk about what other people are doing to fix a bloated face. Although there are Facial Exercises to Slim Face, the slim face exercise you are looking for is in face a massage, a lymph drainage massage to reduce water retention fixing bloatedness around the face. Regularly massaging the lymph nodes around your face helps you smile more with a less bloated face. Simple putting on a smile has a positive outcome in your mood and in those moods of others. Surely without a bloated face, you can pull of the act in flying colors. Practice manipulating your facial expressions in the mirror to pep up your mood as well as exercising the mimic muscle in your face, right after doing lymph drainage massage to slim face. Massage the area around your collarbone starting from the middle working your way towards the outside ending at your shoulders. Work your way up the contour of your face starting below you chin and ending right underneath your ears. Start down the area below your eyes from the arc of your nose stopping before you meet your ears. 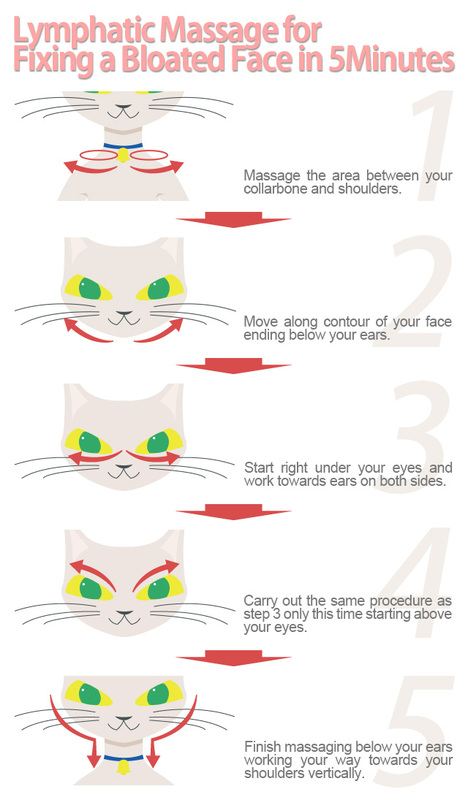 Draw a line with your fingers on the opposite side of step 3, starting right above your nose working your way towards the front of your ears massaging your face. Starting from the side of your face below your ears massage the lymph nodes of your neck down towards your shoulders. Pucker lips together for 5 seconds holding your position. With mouth closed, widen the corners of your face as if you were to smile trying to hide your teeth. Hold this position for 5 seconds. Repeat steps 1 and 2 several times before proceeding to the next step. 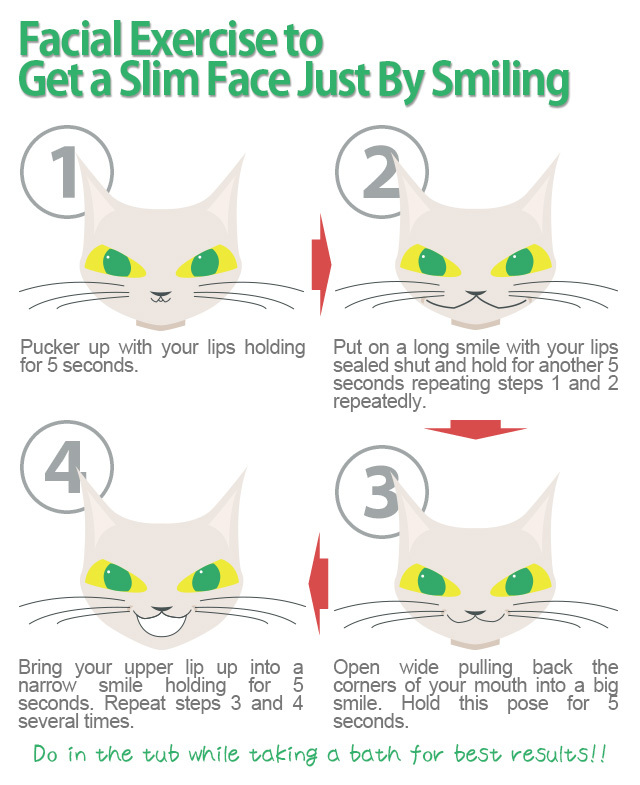 Smile with lips closed bringing the corners of your mouth up as high as possible. Hold for 5 seconds. Open mouth wide pulling back the corners of your mouth holding for 5 seconds. Do step 3 and 4 several times before completing. Do in the tub while taking a bath for best results!! - For more Natural Beauty Tips to do yourself a favor without surgery and overly expensive skin care treatments, be sure to try out other facial massages and exercise that can be found on Slism. The secret to getting rid of a bloated face flushing out unwanted water retention in your face may as well be this facial lymph massage. Whether it is in your diet or the exercise routine you take with you on the road to slim and fit, you are going to need massages to fix a bloated face. 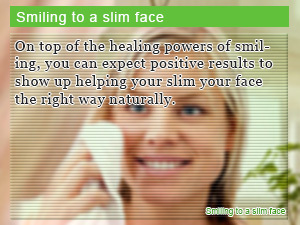 On top of the healing powers of smiling, you can expect positive results to show up helping your slim your face the right way naturally.